Sometimes all you need to create a beautiful layout is a successful combination of colours and a handful of embellishments. The following page utilises a clean simple arrangement of its elements and relies heavily on its vibrant colours to showcase the photos. This layout is very easy to put together and can be completed in less than 20 minutes. The key is to select the correct papers to highlight your photos. This layout was created using Bazzill purple cardstock for the background, Magenta Joyful Times Tangerine Odyssey patterned paper, Susan Branch Lavender Ivy patterned paper, light purple cardstock, and Debbie Mumm Botanical Garden stickers. When choosing your papers, consider colour combinations you have not used before. I love working with purple and found orange to be the perfect match in this instance. Keep your background plain and gradually add 'busy-ness' with each layer. I used a solid colour for my background, but I didn't want it to feel flat, so used Bazzill cardstock for its texture. Using a simple background helps to ground the page and stops the viewer from being overwhelmed. Afterall, your focus should be on the photos, not the background. My next layer is orange patterned paper. Again, I did not want it to appear flat, but I did not want to overwhelm the page. This is why I chose paper with a wash effect. It adds dimension to your page without taking over. When you have chosen your second layer, cut a piece a little over half the height of your page and adhere it to your Bazzil cardstock about 30cm from the bottom. For my third layer, I chose a patterned paper which was a lighter shade of my background. I also chose a paper that was a little busier than my previous layer. As this is the smallest layer, the busy-ness does not overwhelm the whole page, but instead serves to add interest and balance. When you are happy with your selection of paper, cut a piece approximately 13cm by 26cm. Adhere it to your page on the right about 1cm from the top. You have now finished creating the backdrop for your photos. To help your photos stand out matt them with light purple cardstock. I also added a leaf sticker in the bottom right corner of each photo. Position your photos and adhere. Finish off your page with a few stickers. I chose Debbie Mumm Botanical Garden stickers as the flowers matched my choice of colour scheme perfectly and even after finishing my page, I had heaps of stickers left over to use on other pages. I carefully placed two purple flowers on the orange background. 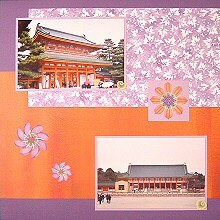 I also matted an orange flower on light purple cardstock and placed it above the bottom photo. I matted this sticker so it wouldn't get lost in the background. I love the colours in this layout. The orange serves very well to highlight the orange of the temple featured in the photos, but would suit a wide range of themes including flowers, daughters, friends, summer and much more. See what you can come up with!